Seated on a carved square pediment, this creamy ivory marble wall fountain features spiral inset columns and molding. A large classical anthemion motif dominates the back splash and repeats atop the cornice. The basin features finely carved scrolling shell details on the front corners. Above the basin, a hamam style brass faucet is seated within a rosette carving. 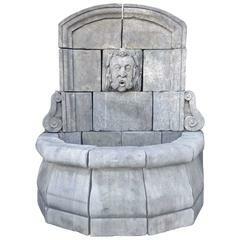 Hand carved hexagon shaped wall fountain. Single spout. Origin: France Measurements: 55 1/2" W x 37 1/2" D x 58 1/2" H.